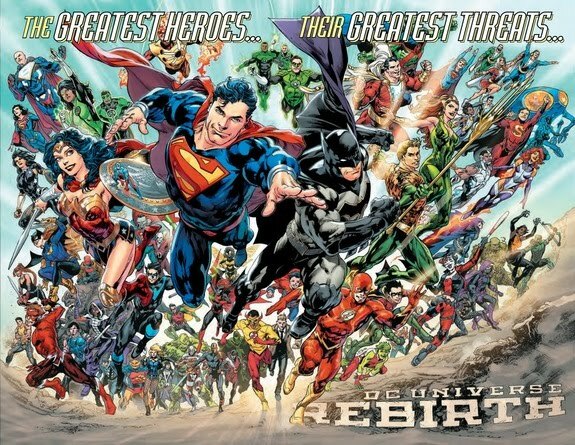 As a long time comic book fan, I picked up DC Universe Rebirth. In the morass that is DC continuity with its constant reboots and retcons, one can easily get lost in the shuffle. What is canon and what isn’t? Did this story really happen? What has been erased from continuity? As a youngster, the DC titles that I read and collected included Superboy and the Legion of Super-Heroes, Blackhawk, Freedom Fighters, All-Star Squadron, Metal Men, the Flash, the New Teen Titans, and anything that had the Justice Society of America. The JSA was my fave DC super-team. I only became a Batman reader after the publication of The Dark Knight Returns because I was a fan of Frank Miller’s work on Marvel’s Daredevil. Superman? Never read it until John Byrne rebooted the character in Man of Steel. Wonder Woman? It took the new series by George Perez for me to come on board. Somewhere in between all of that, I thought that Crisis On Infinite Earths was one of the most important comics of the 1980s and perhaps today given its influence that is still felt in the telling of its modern mythos. When Supergirl was killed by the Anti-Monitor in Crisis, I wasn’t upset. When the Flash crumbled into dust in the very the next issue of Crisis, I felt bad. And I am a major Flash fan. I recall not being too happy with the storylines then but accepted things including Wally West taking the mantle of the Flash because they were done gradually and with a plan. I don’t think it was foisted upon readers. What were my thoughts when Man of Steel, Batman: Year One, and Perez’ Wonder Woman reboot were published? I thought they were some of the best stories about these characters ever told. And Green Arrow: The Longbow Hunters - to this day the way Mike Grell portrayed Oliver Queen is the template for this urban hero. Green Lantern: Emerald Dawn as written by Jim Owlsey, Keith Giffen, and Gerard Jones and pencilled by Mark Bright was pretty cool too. In my opinion, what made these rebooted stories acceptable and palatable to the long-time DC fan was they were not only well-written but they were superbly drawn. They also took great care in paying homage to the past while updating the characters for a modern audience. I am not too sure where it all turned sour. None of the books that I enjoyed as a kid -Freedom Fighters, All-Star Squadron, Batman and the Outsiders etc — were around. The Titans were still there but the great run of Marv Wolfman and George Perez was long done. The Legion? They were so unrecognizable and all the numbering had me confused. When Giffen Tom Bierbaum wrote “The End” in LSH #38 (December 1992 with Jason Pearson and Karl Story handling the art chores) where the Dominators finally destroyed the earth, I felt bad but it was more of a relief. Batman it seemed, was the only consistent one. Yet, I found myself increasingly disenchanted with the mounting body count and the really grim stories. It seemed that with every Joker story, the creative team looked for more gruesome ways to kill and up the body count. Even my fave team, the JSA, was not immune to this. When the Golden Age team returned with new characters and the scions of the older heroes taking their place, they torpedoed into one murderous storyline after another without reprieve. I grew weary after a while. When the New 52 was published, I tried out some titles then completely dropped everything. I came back for Jason Fabok’s run on Justice League but more for the art than the story. I am sorry. I really cannot accept that Lex Luthor is a member of the league more than Wolverine can be an Avenger. That’s like asking Osama Bin-Laden to become a US Navy Seal. Then I got rid of many of the titles I have become disenchanted with leaving what I liked. I found myself purchasing more and more of the pre-Crisis stuff that I liked. I wondered if I had gotten too old for the more comics. I don’t think so. I do get a lot of indies so that debunks that “getting old” point. I think it is more of what happened to good old storytelling? The reboots after Crisis were tastefully done. They weren’t even driven. Just solid storytelling. Let me say that again… I don’t mind the changes, the new characters taking over from the old; that’s life. What I do mind are stories that are done as gimmicks, have no regard to the past, and are sales events for the heck of sales events. If you look across the comic book landscape, the books outside the mainstream titles — the B-titles if you will - are the ones that do well. Who would have thought that Omega Men would be a hit? If you look at DC’s updated versions of the Hanna-Barbera line, it is only Future Quest that pays great care to the original characters and that is why it has been universally lauded. Scooby Apocalypse feels like an attempt to be Buffy the Vampire Slayer and I was so put off by the first issue. Ditto with Wacky Raceland. the characters from the latter two books I mentioned are so far off they are almost unrecognizable. And lastly, there’s The Flintstones that attempts to mimic modern-day concerns albeit in the Stone Age. I am not sure what to make of it. While I know they are all updated, I am not expecting more of the slapstick comedy we know from the cartoons. I just found the Flintstones a heavy read devoid of warmth. I’ll say this though - thank God for Future Quest! And that leads me back to Rebirth. DC can sugarcoat the New 52 all they want but it was a disaster. And the people behind Flashpoint and the New 52 are still behind Rebirth. They don’t admit it but it was a full retreat from the characters and comics that didn’t resonate much with fans; hence, poor sales. DC Universe: Rebirth attempts to tie in everything from Crisis to Zero Hour to Flashpoint. I appreciate making use of the Flash, albeit the Wally West version to touch base with all the time lines. After all it was Barry Allen who opened up all this multiverse stuff in the now classic, “Flash of Two Worlds” in “Flash #123 (September 1961). Because of the revelation in this story that ties in Alan Moore’s “Watchmen” that was never previously part of its official storyline, there will be sweeping changes and minor ones. How this all unfolds will take time. It is interesting to note that Watchmen is said to be the final word on super-heroes. Yet, is it? When “Kingdom Come”, that incredible apocalyptic story by Alex Ross and Mark Waid was published in 1996 (something that began outside continuity but has since been integrated), it started off with the dark tone of the heroes and the world they live in. It got so bad that eventually, humanity decided to take the world back and they nuked the super-powered beings. Those characters who survived the nuclear attack went back to basics. Something that one can draw parallels in comics. Back to basics but moving forward. If the films “Man of Steel” and “Dawn of Justice” are the offspring of “Watchmen” then clearly in this world inundated with almost daily reports of terrorism and death, are sick and tired of grim and gritty. The last word? Hardly. Hence, Rebirth. Am I interested in this new/old direction? For sure. A lot is still not clear. The Batman stories continue but it seems like Green Arrow is new because he never met Black Canary before. In Aquaman, it looks like is only now the surface world is dealing with Atlantis and its denizens. I could just think, I’ll read this stuff and take it for what it is but that can’t be unless this is your first introduction to these characters. A lot is still confusing. What is canon and what isn’t? Checking out but not committed.